Safety critical structures such as nuclear power reactors, offshore oil and gas platforms, or wind turbines require continuous inspection. The majority of these inspections – known as non-destructive testing (NDT) – are carried out manually and expose inspectors to major health and safety risks. Studies have also shown that manual inspection can miss major defects in safety critical structures due to human error. The new London South Bank Innovation Centre (LSBIC) for Automation of NDT will create the next generation of autonomous robotic systems that can carry out inspections with little or no human operator involvement. 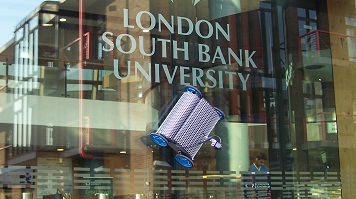 The partnership between London South Bank University and TWI – one of the largest research and technology organisations in Europe ­– will allow TWI's 700 industrial member companies access to LSBIC's research, resulting in a direct route to application. The establishment of the new innovation centre represents the beginning of a long-term strategic partnership that will, in its first five years of operation, provide a home for 14 researchers and eight TWI-funded PhDs. Developments will be led by industry, with the needs of TWI's industrial members determining the direction of research. The LSBIC will be led by London South Bank University's Professor Tariq Sattar, an engineer who has specialised in robotics for more than 25 years. Prof Sattar and his team have received a number of plaudits for their work, and have been awarded research income totalling more than €2 million from collaboration with TWI. Professor Sattar said: "We are excited about providing innovative solutions to the inspection needs of TWI's industrial members. We see this as a wonderful opportunity to take our innovative prototype robots to the next stage of technology readiness level where they become regularly employed in industry to perform inspection tasks. They will keep human operators out of harm's way and increase the profitability of industrial operations by reducing downtime and outages." Professor David Mba, London South Bank University's Dean of the School of Engineering and LSBIC board member said: "The UK's industrial strategy has identified robotics and autonomous systems as one of the eight great technologies in which the UK is set to be a world leader. Therefore this is a tremendous opportunity to demonstrate the impact of many years of fundamental research in robotics which London South Bank University has pioneered." LSBIC will operate from TWI's newly constructed 25,000 square meter world-class facilities in a thriving, industrially driven, professional working environment in Cambridge. Professor Tat-Hean Gan, Associate Director of TWI, said: "I am delighted that London South Bank University has entered into this agreement with TWI to establish the London South Bank Innovation Centre. The collaboration will strengthen TWI's technical expertise in automated inspection, especially for harsh and complex environment applications."